Online shopping is a part of the world appearance today. More and more people turn to online shopping when they wish to purchase various goods – from clothes and food to electronics and even cars. 60+ Best Ecommerce Themes for Any Online Business are definitely worth seeing. The development of online-based business doesn’t mean that traditional offline shopping points or local stores disappear. 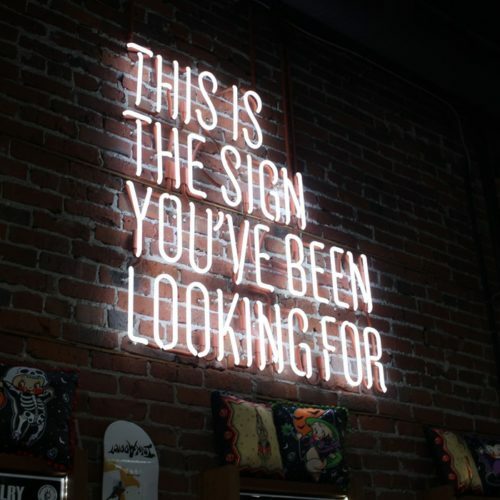 But the trend is huge and more and more brick-and-mortar businesses create online spots to earn a place in the sun and get at least a зiece of this huge online market pie. Ecommerce themes usually have far more creative designs and more versatile functionality since they have very specific goals. These goals are getting traffic and leads, converting those leads into customers and making them come back to the website and even bring some friends with them. 60+ Best Ecommerce Themes for Any Online Business showcased below are aimed at different business niches and provide various sets of tools for each project. Here you will find themes for food suppliers, electronic stores, fashion boutiques and much more. They are based on different platforms like WordPress, Magento, Shopify etc. But what makes them all a kin, is their high-end functionality and user-friendly designs. No matter what platform you select for your project. each of them has its pros and cons. But all those platforms are highly-secure, polished to provide the best experience to the website owner as well as to their customers. Thus, WordPress as one of the best blogging platforms offers multiple plugins aimed at boosting the website’s content performance in search. With WooCommerce plugin WP transforms into a powerful online shopping spot. Or Magento, that includes tons of modules to make a website really eye-catching yet conversion-oriented – it is one of the best choices for an online store for fashion boutique or beauty salon. Most of the below-presented themes include numerous free plugins to make a future website a real power engine. 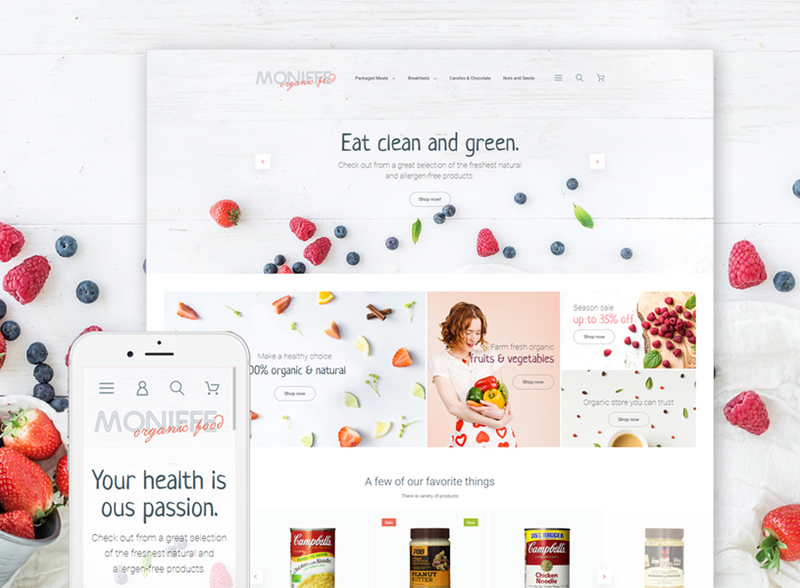 If we speak about the provider of the best Ecommerce-oriented themes, it’s TemplateMonster.com team whose passion and professionalism has created all those beautiful pieces below. Being on the market throughout the last 15 years, TemplateMonster boosted their knowledge and polished their skills in website design. Today they create themes for pretty all platforms including those top Ecommerce templates we mentioned above. So a business owner can expect great choice options for any niche in their template marketplace. The main thing about all TemplateMonster templates is that they are focused at non-techies and tend to provide the best and the deepest info on a theme tweaking, setup, and installation. From detailed documentation coming with each theme to a friendly 24/7 free tech support, all the info about website building is made to make a customer happy. In case busy entrepreneurs have no time for setting up a theme by themselves, they can address a TemplateMonster service center to get their website done by professionals within 24 hours. 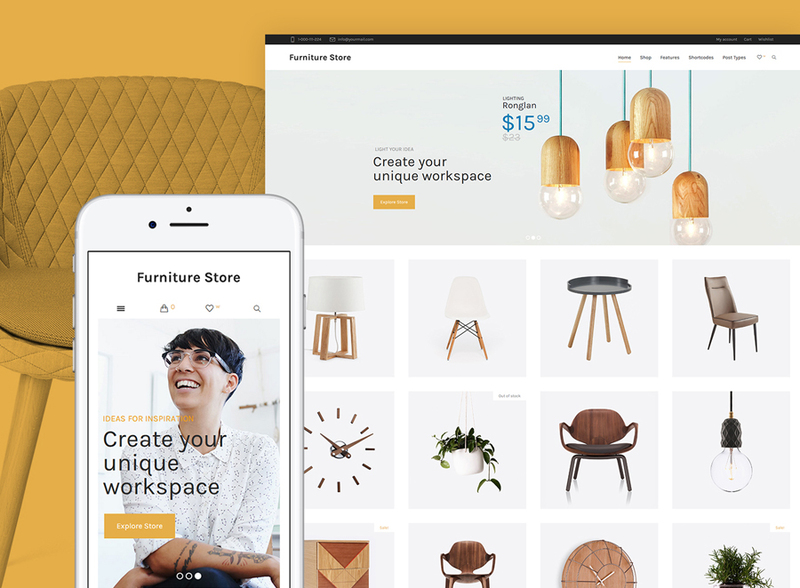 Now it’s time to check out this collection of the 60+ Best Ecommerce Themes for Any Online Business that will make any online business shine. This bright-colored theme will fit a modern fashion accessories store. With its collection of over $1000-worth modules, its amazing functionality is beyond all expectations. Ajax search, Mega Menu, Product labels and many more plugins and options will help anyone creating a cool and professional-looking fashion website. Blog functionality will help to promote products and create cool content to improve website’s rankings. Along with cool functions, this PrestaShop template includes 10 additional themes that satisfy the needs of any fashion-related business. 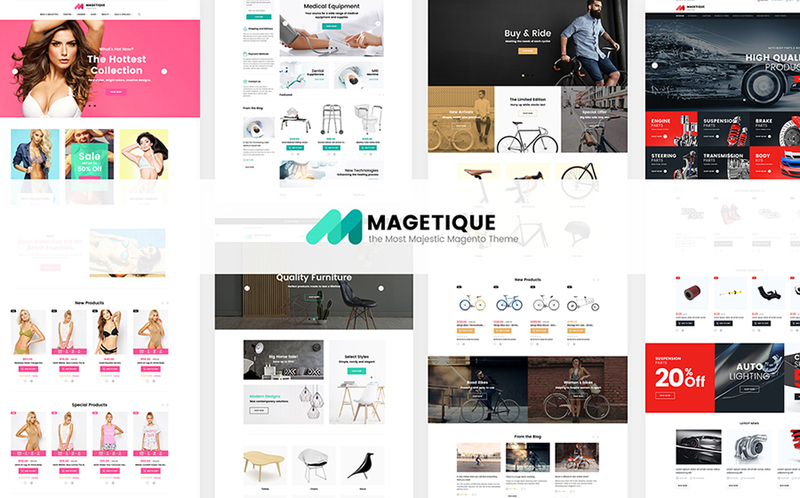 TM Mega Layout builder will help even a novice website creator building a cool website with amazing grid galleries, product showcases and Hero sliders. Unique TM Product manager helps creating user-friendly product pages that will display all the benefits the goods. 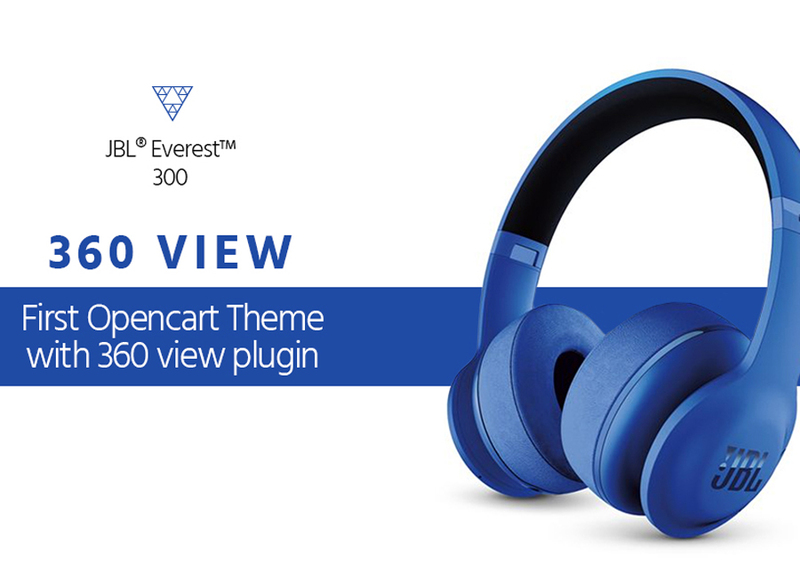 360 View option helps users to take a look of a product from all sides. Sleek and intuitive, the design of this theme is aimed at bringing website owners the highest conversions. As well as providing the best user experience. The theme incorporates 5 pre-designed layouts for different Ecommerce niches. Pre-designed Header and Footer variants help to create versatile designs and choose the one that works the best after A/B testing. Marketing toolbox with Newsletter pop-up, Social sharing, Countdown timer and more provide amazing opportunities for promotion. 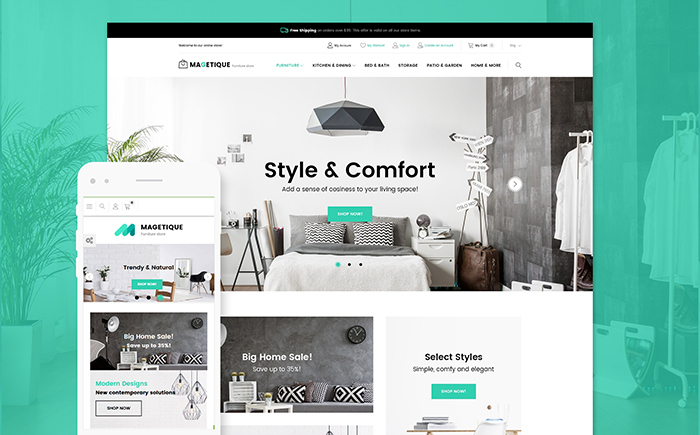 A fresh-looking yet powerful, this PrestaShop theme is a perfect choice for fashion store owners. it features 8 color schemes to provide the best options for any fashion business niche. Exclusive modules provide opportunities for creating a nice online fashion store that sells. 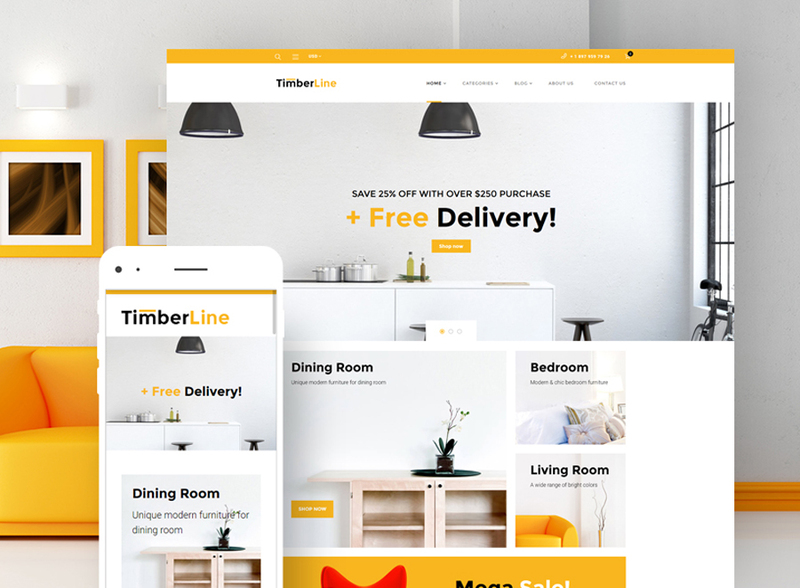 TM Mega Layout, TM Infinite Scroll, TM Products Slider, TM One-Click Order and other exclusive modules help to build a functional design that provides the best user experience. This theme is a nice fit for a fashion accessories store that is based on a grid design and includes multiple unique modules for the perfect building experience. It includes TM Mega menu for the best navigation, TM Slider to showcase products and the coolest offers. Newsletter subscription pop-up will help owners engage the audience and build a solid base of customers. Sorting options functionality will help users to improve their experience with the website and find exactly what they need in seconds. 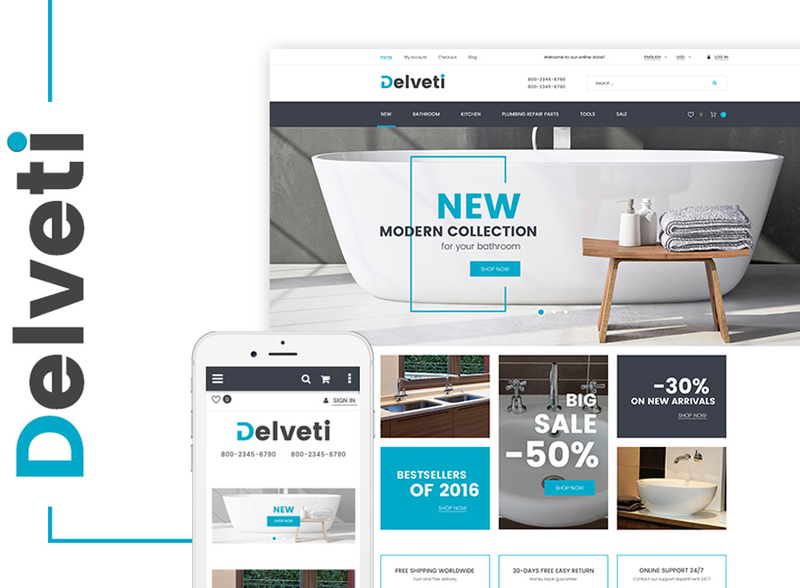 Despite its title, this responsive theme will be a perfect option for any fashion store website due to its bright imagery and attractive layout. Hero images and sliders help with a product showcase that attracts customers attention. Color options allow selecting the palette that fits your brand. Along with these cool design options, the theme features a versatile functionality to build a strong-performing website that converts. Mega Menus, Social sharing, Newsletter subscription and much more, amazing collection of modules for any taste will bring the best experience to users. Grid-based Home page of this template allows showcasing multiple products and product offers right above the fold. It draws attention and creates a nice impression of a website. With a lot of white space, this design allows focusing on the essential aspects of a website and guide users right to the vital offers. It’s cool TM Header account block helps users managing their accounts from any page. HTML content, Product badges, and many more cool modules allow customizing pages and add/remove products with a few clicks. 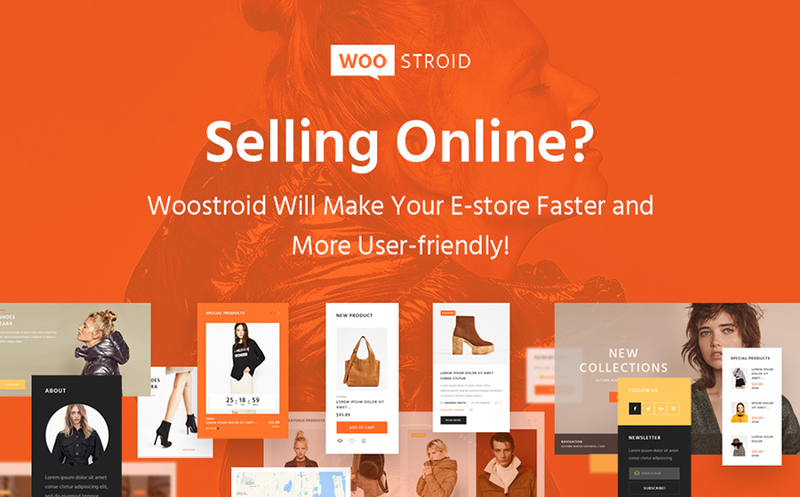 Amazing WordPress-based theme with a set of powerful options, Woostroid will be a great base for fashion store or accessories shop. Bright color palette makes it attractive and energetic. But a set of versatile themes for various business niches allows users to choose whatever color palette they wish. Over 6 pre-made themes inside this multi-purpose template provide business owners with a range of design and functionality choices. It stores 2 Ecommerce plugins inside that bring really endless opportunities for online store creation. User-friendly interface and pure-white design make this template a nice choice for any online store aimed at elegant and fashionable customers. WordPress live Customizer inside helps a website owner tweaking the layout, playing with design options and switching functions with ease. Modules aimed at product pages customization, such as Product Carousel widget or Product Sorting, help to create the best user experience that will result in high conversions. Responsive and SEO-friendly, this theme is perfectly documented what makes a process of its tweaking a snap. This multipurpose theme is a great basis for creating not only a fashion store but multiple other Ecommerce websites. With its multi-section design, one can bring the coolest user experience. 15 pre-made sections include Blog articles, image with text blocks, slideshows, single product and featured products blocks, testimonials and much more. Mega menu helps to create cool menus that provide the best navigation. Customizable Footer adds to navigation options and allows making a website more SEO-focused. Multilingual and multi currency ready, this theme can be used for an online store across the globe. Pink-colored, this theme makes a perfect fit for a nice online cosmetics store. Drag-and-drop Page Builder inside helps to tweak this theme with no efforts and in no time. With its over 25 modules, element presets and other options it becomes a great choice for a non-techie online store owner as well as for an experienced developer. TM Product package brings the building experience to the highest level with a collection of plugins including categories widget, product carousel, banner grid management, on-page menus and more. 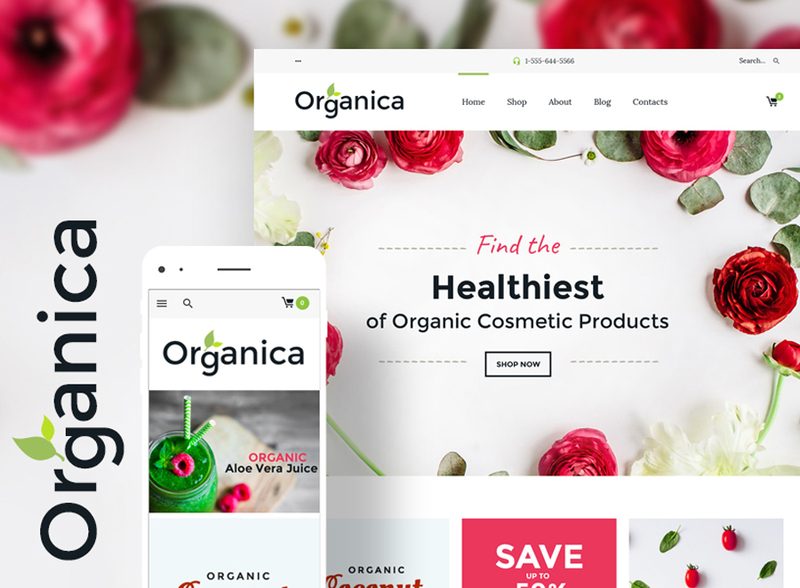 Elegant and tender, this theme features a nice clean design that will fit any beauty store website or an organic products shop. Built with care, it features detailed documentation and a cool set of features. Based on Cherry Framework 5, it offers a responsive layout and effortless customization. Live Customizer helps with this customization providing users with a live experience of all changes they make to the design and layout. Banner ads manager, Newsletter subscription and other widgets broaden tweaking opportunities and help to create a perfect user experience across the website. This white-and-purple template makes a nice option for a beauty salon or cosmetics store due to its chic design and powerful functionality. Multiple TM Modules, included into the package, helps building a website easy to use and providing the best experience to users. Improved navigation, sorting options and live search will make a shopping process for users extremely nice and pleasing. With the newsletter subscription functionality, one can engage users, sending them latest offers, cool info, and blog articles. Enhanced with parallax scrolling, this theme features full-width banner on the Home page that allows presenting the hottest offers. Best Deals section also appears on the Home page and may feature various deals and sales promos. Product badges and various sorting options will help users narrowing down their choice options and select the best products. With the Ajax Cart functionality adding products right to the shopping cart becomes easy and fast. Amazing design of this template features a delicate pastel color scheme which makes the theme a perfect fit for a SPA or beauty salon website. Responsive and SEO-friendly, it features tons of cool functions that will make the website shine. Product Types and Sorting Options plugins is aimed at improving user experience and make the shopping process quick and effortless. Detailed documentation and sliced PSD will help in website customization, installation, and setup. 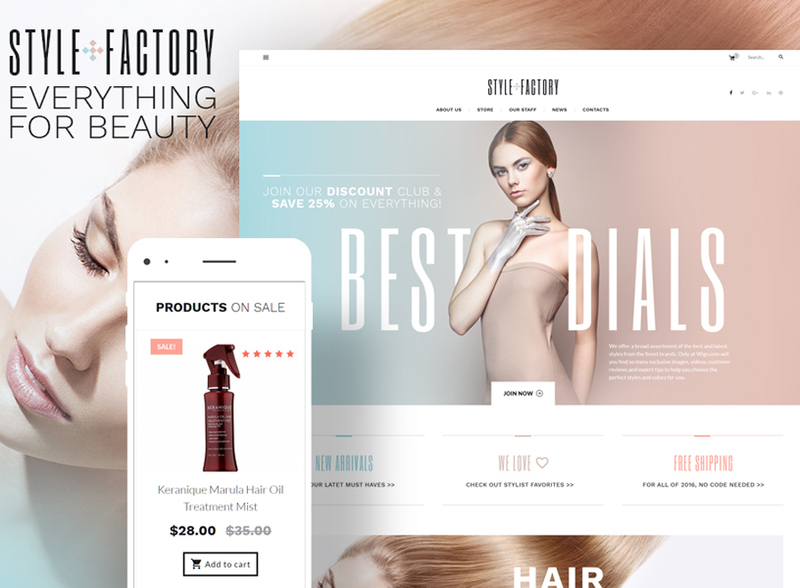 Clean and elegant, this thememakese a perfect base for cosmetics store website. Parallax scrolling, sliders and rich imagery draw attention to the main content of a website – products and seller’s offers. Blog section will be a great stopping point for users to find the best info about makeup, perfumes, and other stuff. Unique Brands functionality adds to the overall UX of a theme and helps users sorting offers not only by characteristics of a product but by its manufacturer. The theme is multilingual and multicurrency ready what allows selling products to anywhere in the world. This PrestaShop theme is made to satisfy the pickiest taste. 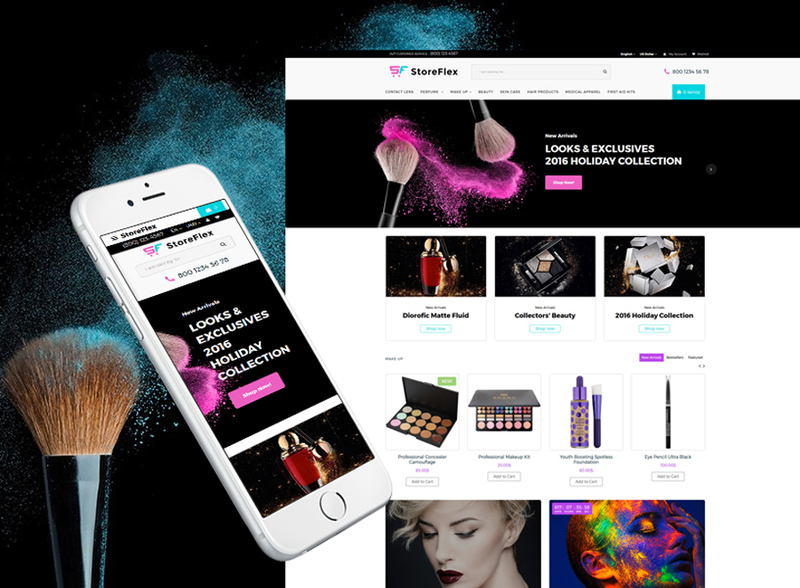 Made with the latest trends for cosmetics or fashion stores in mind, it features huge Home Page sliders, full-width imagery and a delicate color palette. Its cool functionality includes $250-worth modules that help managing the website and improving the user experience. TM Layout Modules allow modifying the theme according to the owner’s taste, refining the layout by dragging and dropping elements. it even has a background video option that should add to the overall website look and attract more visitors. This sleek and modern WooCommerce theme features minimalist design with a lot of whitespace. Delicate color palette is supported with a user-friendly layout and cool functionality. Along with traditional Google Fonts integration and SEO options, it features tons of widgets and plugins that should help an owner making a website one of the best in their industry. Thus, Timetable plugin will help you scheduling meetings with your customers. while appointment Manager will help your customers to book the time right on the website. 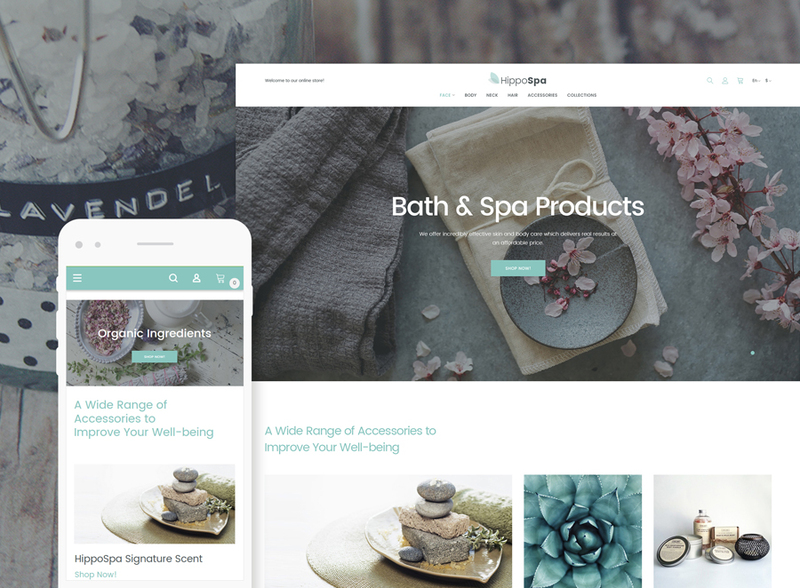 Crafted with care, this theme is made in tender pastel tones that fit a cosmetics store website or a wellness center. Multilingual and multicurrency, this theme is ready to be used for international projects. Mega Menu functionality will help to create a user-friendly interface that will make navigation across the website a snap. Login Drop Down and Social Login options are aimed at providing users with the best experience across the website. Ajax Search functionality makes it easy for customers to find what they really need. This Hair Salon theme is based on Bootstrap and Cherry Framework what makes it fast, easy-to-manage and fully-responsive. Any beauty business niche will make a perfect use of this template due to its clean design and logical structure. Custom pages add to the website design greatly and allow creating a fully-functional website within a few hours. Sliced SD, audio and video integration features help to make a top-notch website that attracts users and sells. Food delivery website will shine with this Magento theme. Imagery-focused, its features tons of helpful options that either aimed at making the customization process easier, or at improving your customer’s experience. Rich slider and animated CTAs will attract visitors attention and make them wish to order from you. Ajax-based features like Search, Product Filter, Cart etc. make website use a pleasing experience. Newsletter pop-up will never leave your users without the latest news from you. 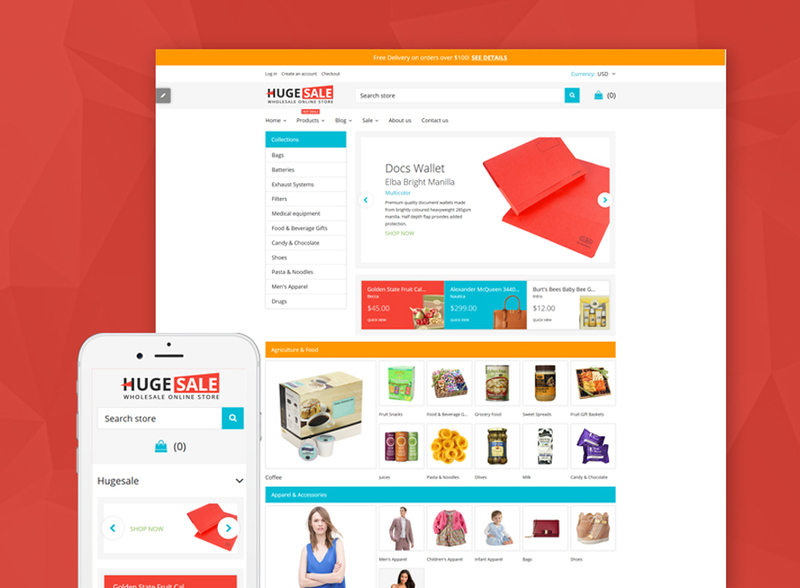 Responsive and attention-grabbing theme for Magento. It combines an outstanding design with a full range of options. Flip slider allows showcasing meals and products in store from the best side. Featured Products and Featured Brands options are made for drawing attention to selected products. Rating system and testimonials section help to raise awareness and build user’s trust to the website and the overall brand. 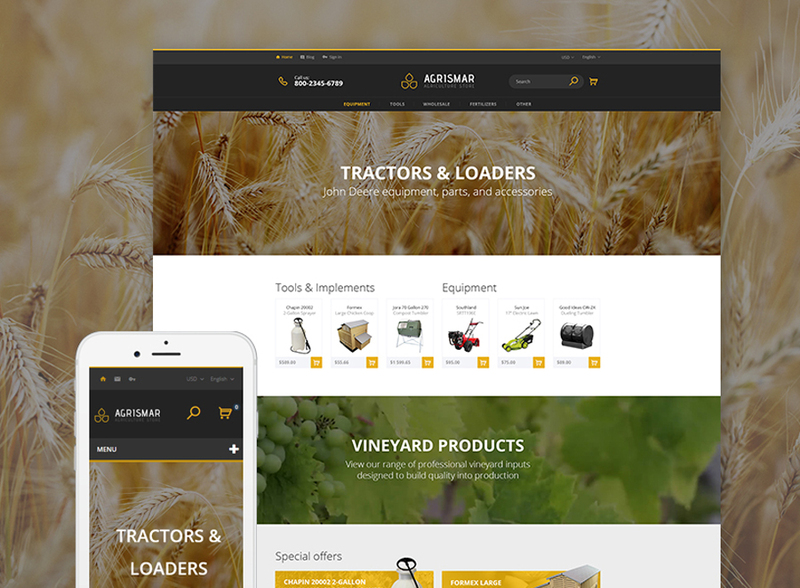 WooCommerce-ready theme is aimed to be a great fit for agricultural and farm stores websites. Based on Cherry Framework 5, it is fully-responsive and easily customisable. Product Badges and Labels help in drawing attention to selected products in store. Wishlist and Compare plugins allow customers to select the products they wish to save for later. And its Banner Grid widget makes a nice layout option. This neat and clean theme is made in white color with coral accents for fresher look. Exclusive plugins make it not only good-looking but also highly functional. Thus, Mega Menu functionality will provide your customers with a sleek navigation across the website. Ajax Search also adds to navigation feature and help your users finding what they need really fast. Blog integration will add to the overall user experience as well as to SEO. Nice handwritten fonts complete the look and make the design warmer and cosier. Grid-based design of this food store template allows displaying multiple products right on one Home Page. Media Parallax option and Homepage Category Gallery also aimed at helping you showcasing your products in the neat and organised way. The theme also features Product Quick View – a nice feature that let users see detailed description of a product without reloading a page. This sweet shop website template features 3 pre-made layouts what makes a theme pretty versatile and ready for various projects. It also offers tons of powerful plugins that should help a business owner building a chic and well-performing website. Thus, One-Click Order Feature allows ordering goods with a single click on a button. TM Header Account feature allows users log in to the website with their social media accounts. The theme also features Deal of the Day plugin that allows presenting selected goods for sale. This grid-based design is made for a quick start of a food website. Ready for localisation, it will be good fit for an international website. It also will add a lot to local SEO due to its multilingual-ready base. Header banners hep attracting customers’ attention to selected products while list or grid category view options allow choosing the way of product presentation. Product label option also helps in goods categorisation. As a professional theme, Longud combines a fascinating design with powerful functions. The theme is mobile-friendly meaning that users will be able to place orders on the go with no efforts. Ajax sorting options allow sorting products based on their size, price, popularity and other characteristics a website owner sets up. Mega menu functionality saves users from browsing a website purposelessly. While the company blog will not only halo improving rankings but will also keep customers engaged and interested. It is a colorful and energetic Shopify theme that makes a nice base for a fruit store. Featuring vibrant design, this theme also bears a versatile functionality that allows building a perfect online shop with ease. Brand Logos and Testimonials slide will help you increasing awareness and build users trust to your brand. Customisable nammers and various sliders for categories and products will add to the website conversions. Mega menu will never leave your customers lost while newsletter pop-up help you engage with your clients. 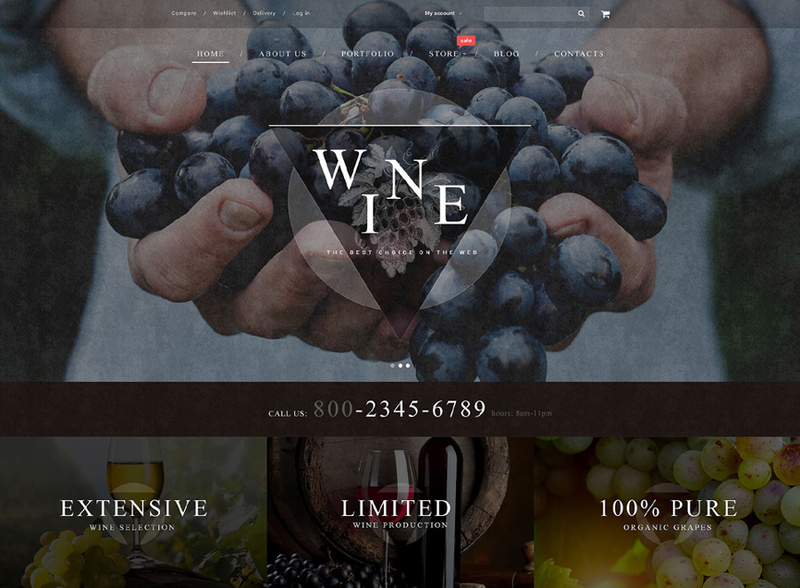 Wine theme for WooCommerce features Hero Slider on the Home Page. It helps attracting user’s attention to the products and deals an online store offers. Grid-based products gallery allows showcasing more products n a Home Page without making it look cluttered. Intuitive navigation makes website browsing effortless and quick. Custom post types allow a website owner creating a blog with great content that should attract visitors and make a website more SEO-friendly. Elegant and cool design of this template will make a perfect base for an online store. Grid gallery, huge sliders, parallax effects – all these features create a sense of depth and movement. Ajax search and Mega Menu features will help create a flawless navigation across the entire website. Product badges will help users to tell one category of products from the other while Wish List and Compare plugins will make their choice easier. This template is aimed at plumbing services and good businesses. Its flexible and responsive structure will help a store owner creating an attractive and conversion-friendly website that will be easy to use no matter what device a customer operates. Huge background image slider make it easy to showcase the latest products or the best offers. The website also includes a user-friendly functionality like Sorting options and Search that will help customers in decision-making process. Minimalist design of this template will make a great it for any business website. Lots of whitespace and restrained layout architecture speak of professionalism and serious approach to business. Multilingual, this theme can be used for international businesses that sell their goods online. Cool features like Quick View and Product Zoom will make this website friendly to all users and accessible from any device. 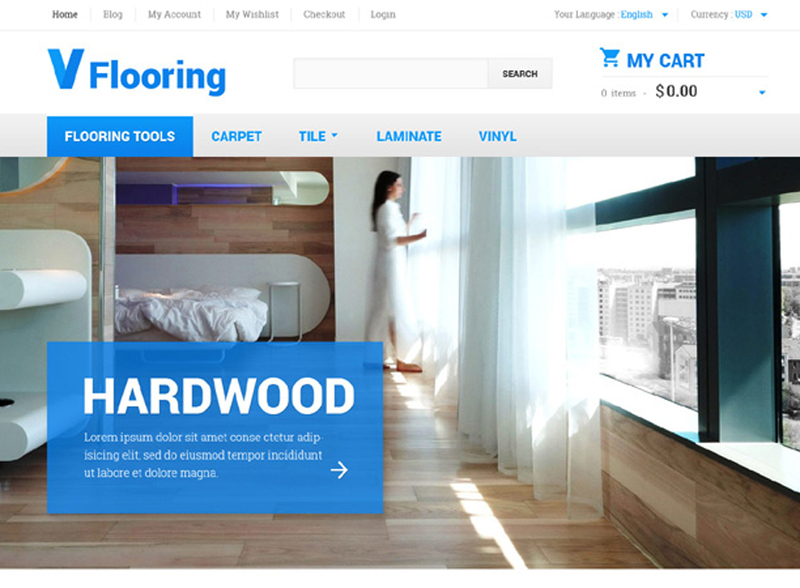 Nice and clean theme with bright color accents will be an amazing base for any online store or service provider. Color scheme switcher add flexibility to the template and hep making it suitable any brand’s color palette. The Home page of the theme is made to showcase categories in whole instead of accenting certain products. Powerful functionality includes Ajax Search, Ajax Cart, Product Quick View, and Options. Carousel gallery will help to show all products from a selected category while Mega Menu make website browsing effortless. This white-and-blue theme is filled with air and freshness. 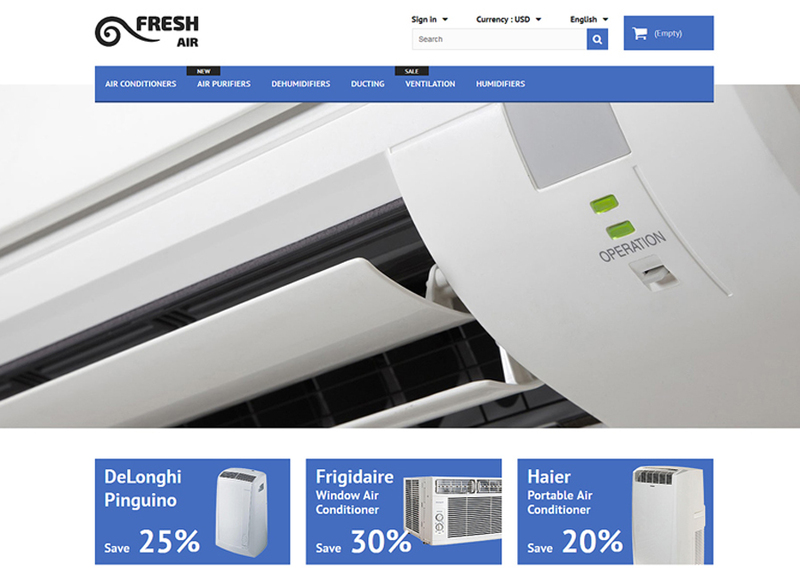 That’s why it is dedicated to air freshness systems store. however, users have another option and may use a white-and-red color scheme. Its manu is assisted with tooltips what make navigation even easier. Tabbed navigation in Product sections also add to user-friendly website surfing. An owner can also choose which option – list or grid – to use for presenting products on categories pages. This bright-orange theme is created for tool and supplies stores. Its large image slider on a home page can function as a pretty design element and as a promo board for displaying the best offers and the hottest deals. Font Awesome Icons integration makes this design attractive and attention-grabbing. Product labels will help a website owner to label products on sale, the hottest deals or new arrivals. Translation-ready, this theme will be a perfect fit for a worldwide-shipping business. This security equipment shop theme can boast an elegant monochrome design with bright blue accents for a fresher look. Theme Color Switcher allows changing the color palette to make at suitable brands colors. Its slider on a Home Page makes showcasing the best products to customers a smooth and eye-candy process. Brands functionality allows displaying brands that available in the store right on the Home page. Unique structure of this theme’s layout make it appropriate to almost any online business niche. Grid-based Home page gallery, functional sidebar with website categories, parallax effect for deeper user experience – all these design tricks make the theme a cool option to consider. Blog section will help an owner to create a loyal community of customers and improve SEO characteristics. Facebook like box will boost content strategy efforts on social media. This elegant monochrome website theme will attract users with a clean layout, responsive design and original elements. Drop-down menu as well as drop-down shopping cart makes it easy for customers to place orders without having to reload a page. Parallax effect adds more power and depth to the theme look. Minimalist buttons perfectly fit the overall design concept and function smoothly. Warm and fresh design of this template will be an amazing base for conversion-focused website. Integrated TM Mega Layout Module allows switching between a number of pre-made layouts to choose the one that suits you best. Aimed at small- to mid-size online businesses, it features Ajax Search, Product Badges and Sample Data Installer functionality. All that makes theme customization and management a fast and headache-free process. This pure-white theme is aimed at medical supply store. 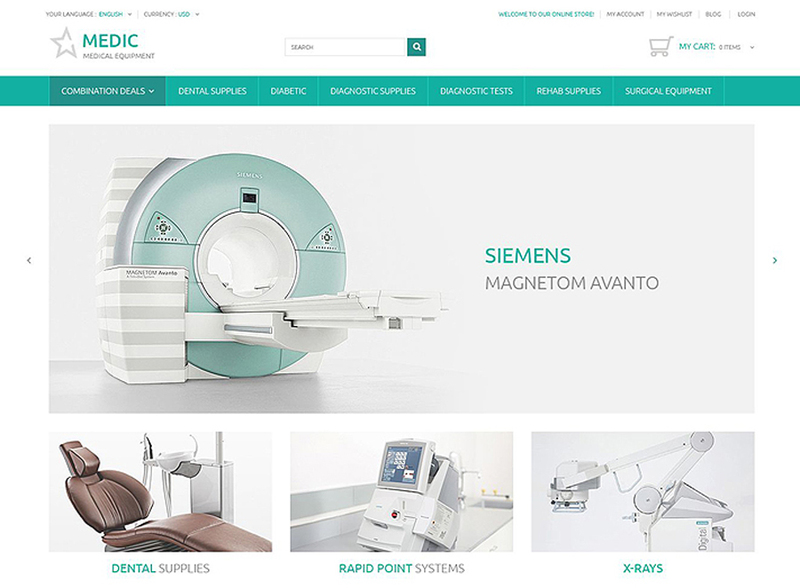 Gentle light-green color accents also speak about a medical-themed website. Mega menu provides a quick and easy navigation while staying sticky to the top of the page. Product-management functionality includes Grid/List categories view, Product labels, Star ratings and many other options. And don’t forget about its mobile-friendly design what makes the website easy-to-use on any kind of device. Rich on modules and plugins, this bike store theme is aimed at providing the best user experience and contribute to high conversions. Ajax shopping cart and Quick product view help users making purchases with a few clicks. TM Mega Layout module allows tweaking the design and page structure to the full extent to achieve a really powerful and unique piece. BonVoyage theme is made for travel agencies and hotels websites. With its rich visuals it attracts customers attention and with its powerful functionality – it is aimed at bringing high conversions to the owner. Mobile-friendly and cross-browser compatible, the theme will look perfect on any device and within any browser client. Contact form, online chat and newsletter subscription options will help a business engage with customers and build loyal community. Fishing business also needs a website. With this theme a fishing equipment store will have a cool online spot to make high profits. its layout and design is strongly built to store content-loaded projects. Ghost buttons and hover effects add zest and bring to the overall design a sense of lightness and freshness. Full-background carousel slider on a Home page helps showcasing products and presenting other content to the best. Any sports equipment Ecommerce project will benefit of this cool responsive template. A great collection of multipurpose tools and plugins make it easy to tweak and manage on the go. Social login option is added to enhance a user experience and make it easier for customers to make purchases. Mega menu and slides add more flexibility to the shopping process. Well-documented and worldwide shopping-friendly, this travel agency theme is rich with visuals and built with power. Hero slider enhances functionality and presents the best deals or the latest news from the company. Color switcher makes it easier for brands to distinguish themselves from competitors. Chat and newsletter subscription options allow always stay in contact with the new and loyal customers. This theme is a wonderful solution for creating an online spot to sell sports equipment. Multiple options for Header, Footer and Home page layouts makes this template a really multipurpose piece. Customization-ready. these elements can be easily switched and changes with just a few clicks. Multilanguage and multicurrency options will help you to bring your business to the world. 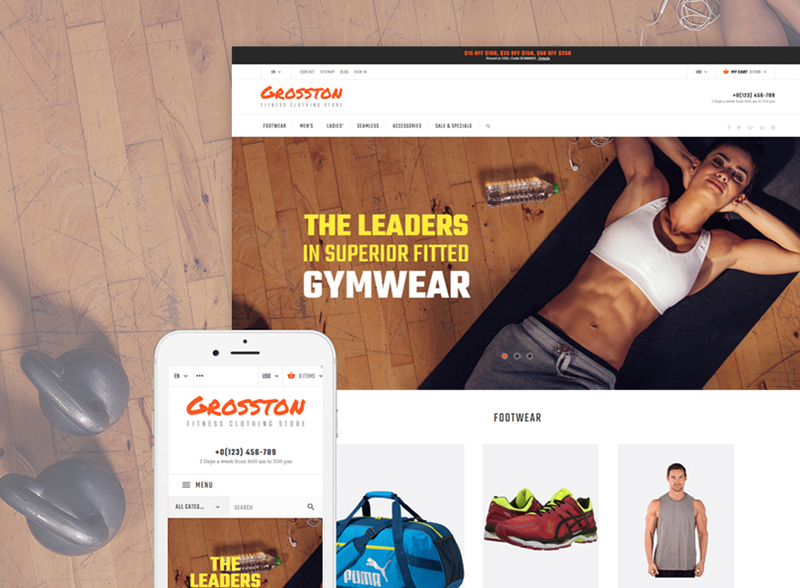 Any sport and fitness website will shine with this user-friendly and powerful theme. Full with beautiful photos, it is powered with a huge slider that allows displaying the latest product arrivals and the best offers. Quick view option makes a decision of purchase easier to a customer. Brands list on a Home page helps building trust and improving customer-seller relations. 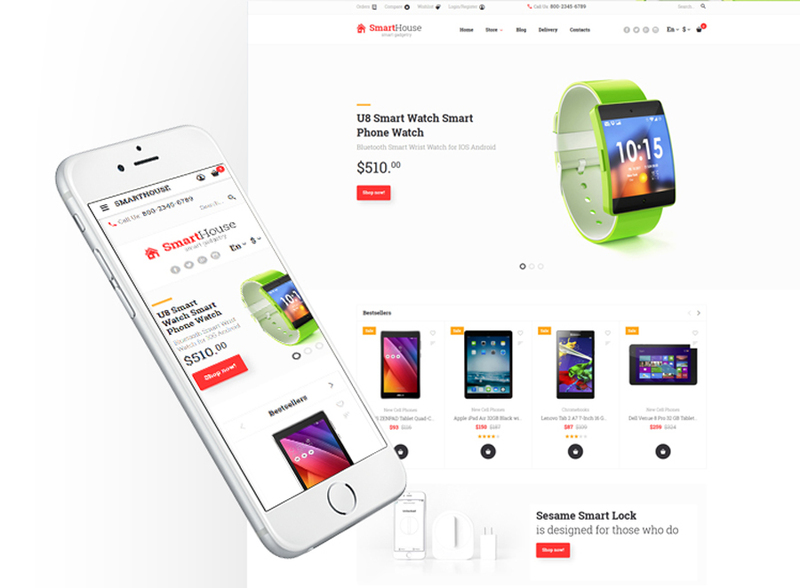 Responsive out-of-the-box, this Ecommerce theme will suit a modern electronics shop. Lots of whitespace along with blue color accents make a contemporary and trendy design. Its function-loaded header give access to all the most essential options like shopping cart, account options, checkout, categories and menus, currency/language switch and search bar. Sale badges and cut rates attract attention to the best deals of a brand. Clean and simple layout of this modern electronic store theme makes it easy-to-use even for a novice customer. Crafted with care, it will help any online business to get crowds of customers and leads. Customizable Mega Menu make navigation across the website a no-brainer. Cool catalog and product pages as well as carousel product listings add more flexibility and powers to its functionality. 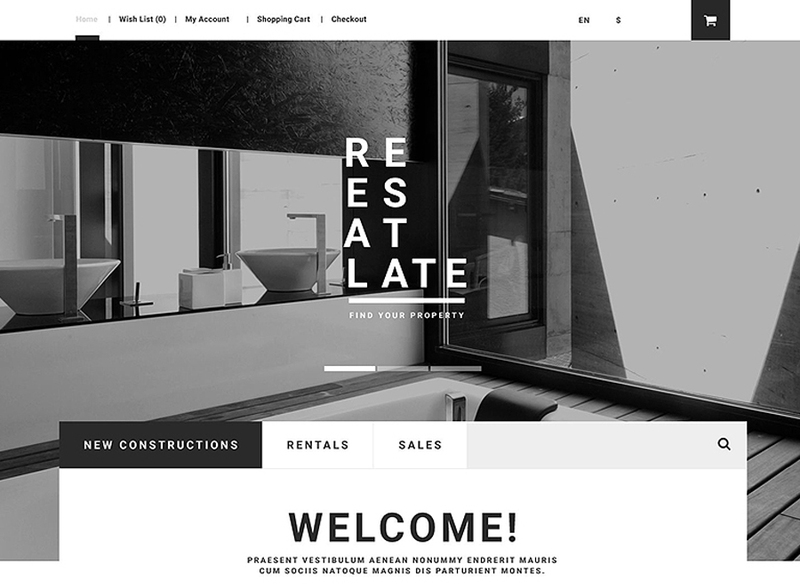 Trendy-looking, this template is created for the modern fancy store website to bring it customers and fame. Image sliders and background video functionality add energy to its rugged look. Finding necessary products becomes easier with Ajax search option. A cool blog module allows creating a company blog to bring more traffic to the website. PSD files and detailed documentation save you time for tweaking and installation. Mobile accessories store owners will definitely appreciate this cool theme with its top-notch functionality. Its TM Mosaic Products module allows showcasing products in a unique and original fashion. It also helps refreshing the age with a few simple manipulations. 3 amazing pre-built layouts come inside the package what allows you experimenting with the website look without having to purchase new themes. Everprest family of templates features 4 pre-made layouts for any niche of an Ecommerce website. 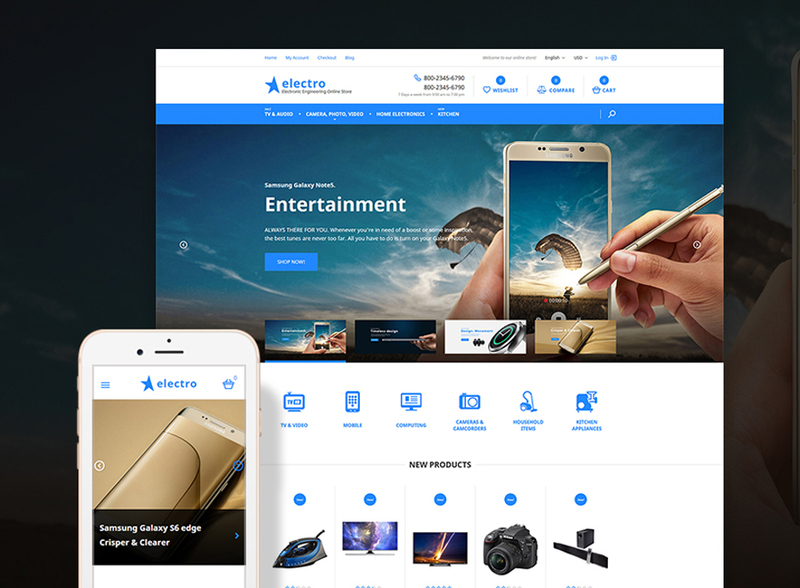 This niche theme is aimed at electronics store owners and provide equal shopping experience for smartphones or laptop users due to its responsive nature. 10 premium prestaShop modules are included into the package for free. Thus, TM Mega Layouts module boosts customization process while TM Collecton module allows users create and save their own collections of goods. This dark-tones design is made for online music store owners. Particularly, it features all the functionality an Ecommerce website may need. Mega menu for easier navigation across the website, slider for product showcases, carousels for the same purposes… Rating option is displayed next to each product by means of stars icons. In fact, grid layout, blog posts functionality and many other options are also available to make this template an amazing starting point for an online business. 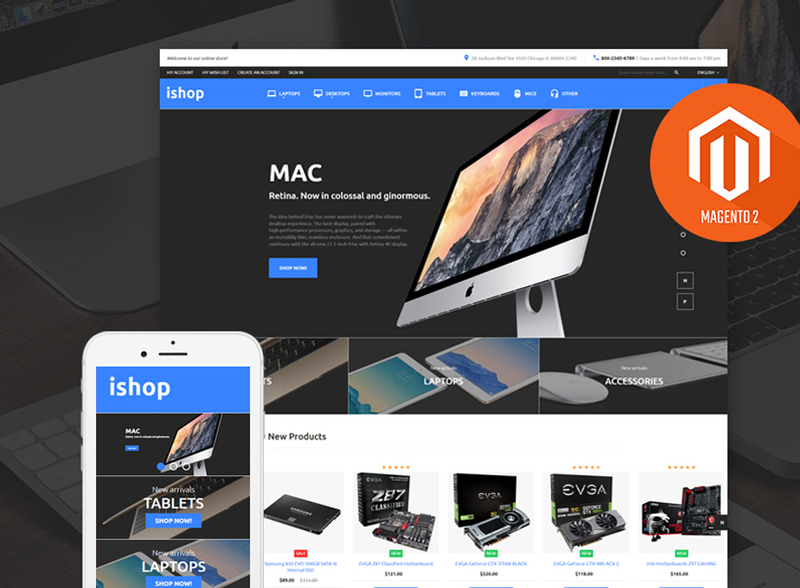 One of the advantages of this electronics shop theme is its minimalist design and carefully-crafted UI that leads users perfectly to the purchase. Thus, amazing set of TM modules makes the template a real power engine for Ecommerce niche. Social media integration along with the newsletter subscription pop-up help with marketing goals. So, ajax search and filtering functionality add a lot to the user experience thus resulting in the conversion boost. 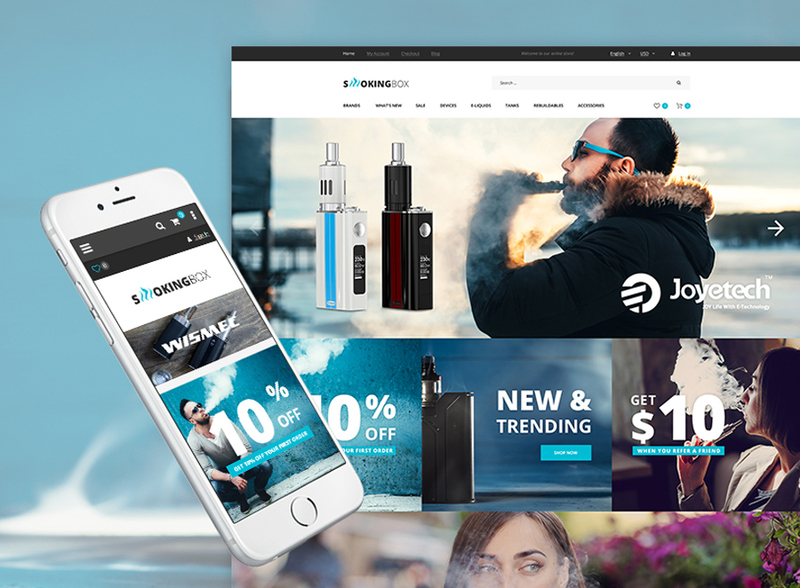 Combining the energized design with the high-end functionality, this mobile store theme makes a good use for business owners wishing to go online fast. Additionally, language and currency switcher on the Home page allow aiming at the worldwide market. Social login option along with the traditional one make it easy to use for customers and make the website ore user-focused. At last, subscription form pop-up helps you growing the lust of your followers. Another theme that features minimalist design and clean layout that have got tons of positive feedback from users. Moreover, pure white along with bright blue, this color scheme allows focusing attention to the products without overwhelming the users with design gimmicks. So, a unique 360-degree plugin allows viewing products from all sides and forming an opinion before purchase. This pure-white theme is a great fit for electronic accessories store. Additionally, with this design comes in handy a powerful collection of plugins and modules aimed at boosting conversions and improving UX. Color switcher let changing the color scheme according to your needs and brand concept. Parallax, subtle animations, slider and carousels – everything is made to make the website look beautiful. Therefore, Megafooter allows placing all the vital links below the fold to save the layout from clutter. Part of a Magetique family, this template is aimed at interior design studio owners. Moreover, amazing sliders and product banners are perfect for showcasing the latest and the best projects. Deals, discounts, new offers and sales can be also displayed on the Home page in a form of carousels or grid galleries. So, blog module helps posting attention-grabbing articles and unleash SEO powers for your website. Aesthetic look of this design will definitely attract design aficionados from all over the world. Thus, sleek look is supported with a smooth navigation and the overall cool user experience. Hero slider contains retina-ready images that will look great at any device due to the responsive nature of this template. At last, mega menu, detailed documentation – this theme is as easy to browse, as it is to manage. This unique theme is based on a grid layout that allows showcasing a great amount of products right on the Home page. In addition, this sleek and highly-flexible piece features a ton of modules and plugins that help building a powerful Ecommerce store. A Custom Composer plugin included into the package stores over 100 shortcodes that help with customisation and management process. So, form builder plugin that allows creating various forms for a website is included for free. 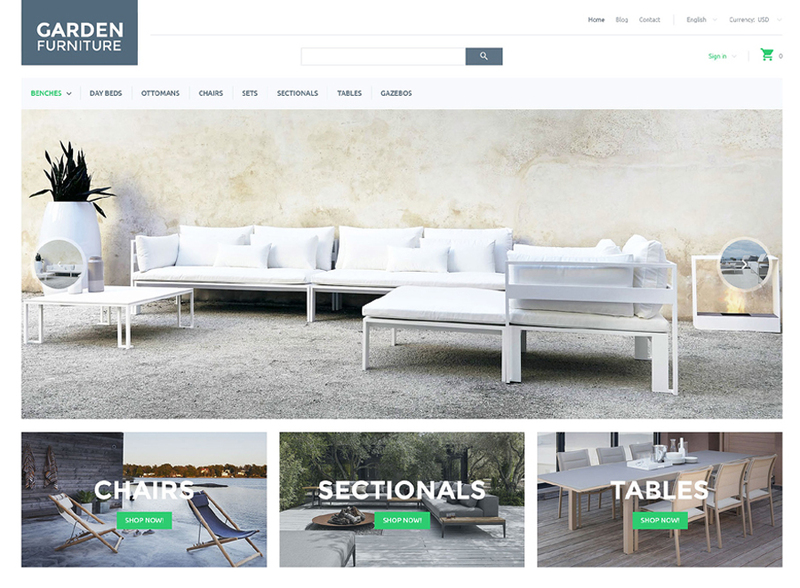 With this responsive and SEO-friendly theme one can build a nice furniture store website in no time. In fact, banner grid widget helps promoting your products with 6 stylish options. Moreover, its clean design allows featuring numerous products right on the Home page and supporting them with Product Badges. As with many templates for Ecommerce, cool Wishlist and Compare plugins come in handy with this theme. And finally, the best products can be featured within a Carousel slider. This nice clean template features bright yellow accents that create an atmosphere of a sunny house in the woods. Therefore, its responsive design is supported with a built-in carousel plugin, chic gallery plugin and a trendy portfolio plugin that help presenting the products and the most successful projects to the audience. So, banner manager allows posting promos while Wishlist and Compare functionality help users to manage their preferences. 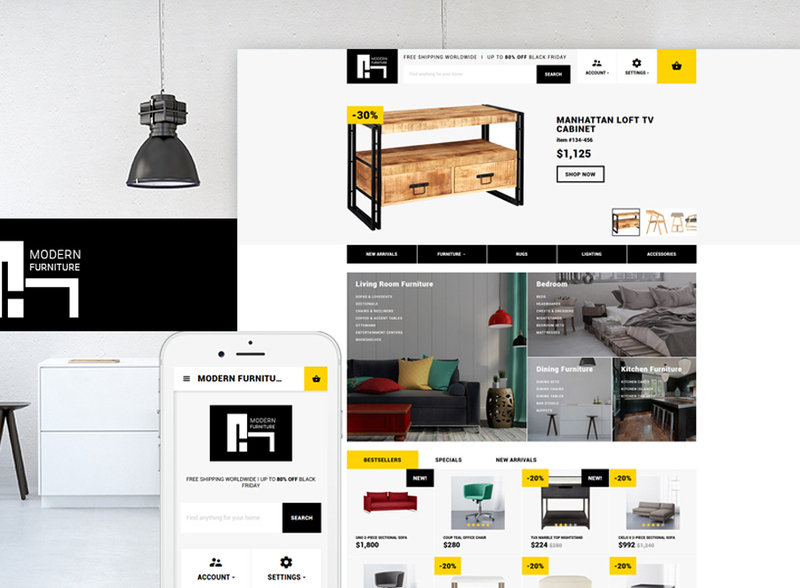 With this feature-loaded theme one can create an online furniture store with ease. Moreover, a user- and manager-friendly solution, Decorta stores a bunch of amazing plugins, modules and features that help building a responsive and SEO-friendly piece. Therefore, TM Mega Layout module allows switching between pre-made layouts, experimenting with their look and options. Finally, a cool TM Mosaic Product module allows showcasing the product in an eye-candy mosaic style. This website can become your best option for building a website with its pastel color palette creates a proper look and feel that fits for a garden design studio website. In particular, users will easily navigate across the website with the use of a Mega Menu and Ajax search bar. Additionally, a sticky option of a menu, that makes it visible wherever the page a user is, helps improving UX. So, product badges and Quick View functionality along with a hover option, help users to make their product choice easily. 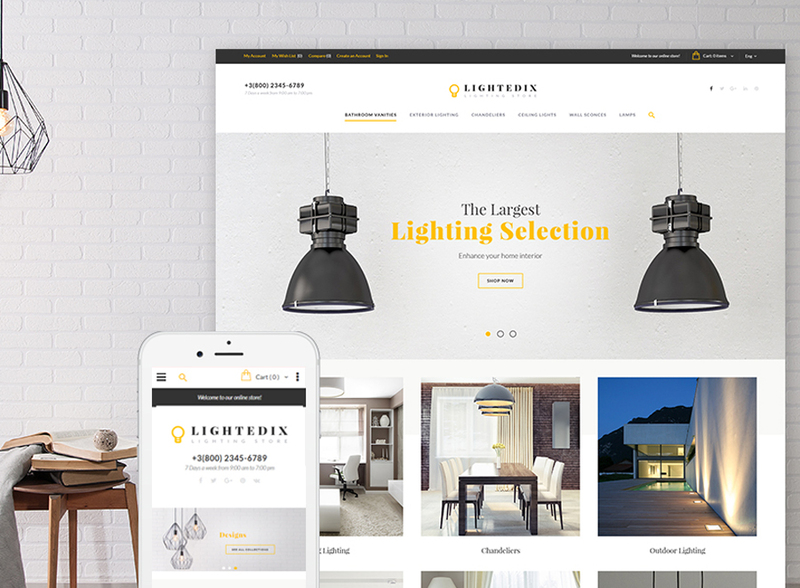 This design aimed at modern furniture website features a clean style layout and tons of useful features. Moreover, ajax-based options like Search, Shopping Cart and sorting options, provide users with an outstanding shopping experience. Additionally, testimonials section along with one of Team Members help improving relations with users and building trust to you brand. Multilingual and multicurrency ready, the template allows bringing the local business to the worldwide market. Minimalist design of this theme allows focusing all the attention to the products for sale. In addition to a sleek design, the template is loaded with tons of plugins, modules and features that help improving conversions. These plugins are aimed at making a website user-friendly that should lead to big sales. At last, responsive and SEO-friendly layout ensure the user experience will be great even on tiny smartphones screens. The last but not the least. Therefore, this Shopify theme combines amazing design with grid gallery, slider and cool imagery with powerful options aimed at boosting sales and improving user experience. Blog and contact form options help building strong relations with your leads. Moreover, sorting options feature helps users saving the products they liked for later purchase. Testimonials, Google Maps and Google Fonts integration allow tweaking the design to the full extent.